For larger openings, overhead doors, dock doors, storefronts, commercial and industrial use. These two-piece gates can be made to any size width, and a maximum height of 10'. Since they are Double Gates, each side will swing (pivot 180 degrees) out of the way. This is ideal for dock doors and overhead doors. Trucks and other traffic can move freely in and out without any interference from the gates. Our Double Folding Gates are made from standard type channel 3/4" (14 gauge), riveted back-to-back with 1-1/2" x 1-1/2" x 1/8" side rails for extra strength. The top bracket (H-Bracket) is optional and keeps the gate secure at the top while a center drop-pin provides maximum protection at the bottom of the gate. Gates will lock together at the middle with use of a standard type padlock. All Gates are shipped complete with two mounting brackets, two washers, two casters, and a drop-pin. An H-Bracket can be shipped at no additional cost. For gates that will be installed inside a dock door, extended brackets can be ordered to keep gates back and out of the way of overhead doors. All Folding Gates drop an inch per foot upon expansion. Our Gates are painted enamel black. 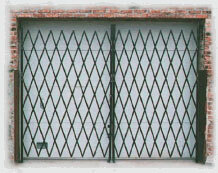 Steel Folding or Accordion Security Gates provide security, ventilation, and visibility for warehouse dock doors, lift-up doors, office buildings hallways, and entranceways. Portable, Aisle, and Pet gates are a perfect temporary or mobile security gate for many applications. "L" mounting bracket, washer, and installation instructions are included. Note: Custom Sizes are non-returnable.